When we initially drive past the cafe I swear I see people sitting out the front, but when we park and wander in, we notice it’s a mannequin dressed up to look like a patron. It doesn’t really make sense, but it makes you notice the place nonetheless. There’s a rabbit warren of seating: inside, outside on the deck under umbrellas or in a semi covered dining area or in the garden. Wherever you sit you’re no more than spitting distance from the small river out the back that apparently sometimes have the elusive platypus paddling about. The scones are fluffy, creamy and oh-so-fresh, although they could be a little warmer. The raspberry jam is rich and fruity, and so it should be, berry farms surround us. 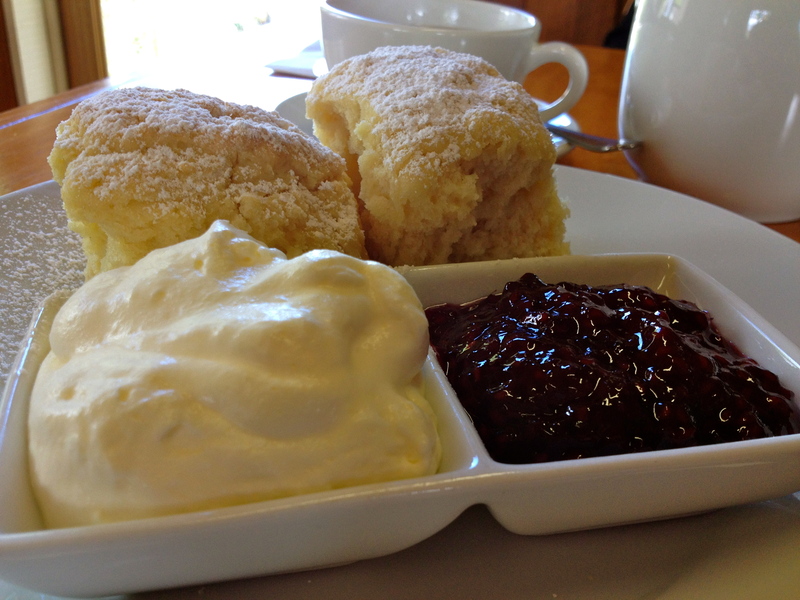 The thickly whipped cream is the final magical touch to an amazing Devonshire Tea. A truly worthy pit stop. Tea: A wide range of loose-leaf tea for all tastes served in good-sized pots with extra water on the side. Overall: A beautiful spot by the river. Waterfalls Cafe is no doubt named after the Russell, Lady Barron and Horseshoe Falls that are a short walk away from the Visitors Centre. The Russell Falls are the main tourist drawcard to Mt Field National Park and is famous for being chosen as one of eight images to appear on a series of postage stamps in 1899. Further afield, the park offers longer day and overnight walks in the alpine area above Lake Dobson and around the Mt Mawson ski fields. After any of these hikes you’re sure to work up an appetite, so a quick pit stop at the visitors centre/cafe/souvenir shop on the way back to the highway is a must. While we wait I peruse the Tassie souvenirs in the shop and watch a DVD that shows an impressive collection of photographs of the Apple Isle. I love the doily on the plate, you don’t see that very often and it adds some class to the presentation of the Devonshire Tea. The scones look impressive but are a tad rubbery from being heated up in the microwave and there are small bits of hard pieces of dough throughout – not sure what that is. Shame as I think they would be tasty had they been fresh. The raspberry jam is exquisite – rich and fruity – but the cream too light and airy. Tea: A variety of teabags served in a small pot. Overall: An airy cafeteria feel. Ma Foosies cafe has a history almost as old as Richmond village itself. Built in 1831, it was the former Bridge Inn until 1836, and then the building was transformed to a bakery, butchers, tailors, Doctor’s Surgery and then a residence until 1982 when it finally became a cafe. Unusually named, the word ‘Foosie’ originates from Ireland where it was used by Mrs Duffy Senior to describe all sweets and treats she found irresistible. I arrive at 9am for an early morning tea and join a smattering of people enjoying breakfast. The scones are served piping hot, fresh out of the oven, and are delectable. The raspberry jam is tasty, but there’s barely enough for one scone. The fresh cream is lightly whipped, but I need something a little heavier on my scones. Gluten free varieties available. Tea: A small variety of loose-leaf teas. 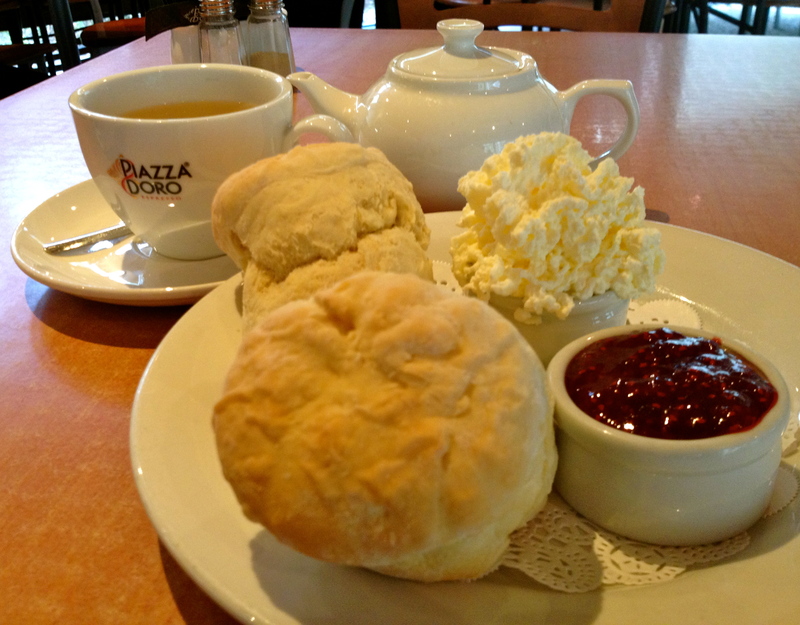 Overall: Great scones in a pretty town steeped in history. 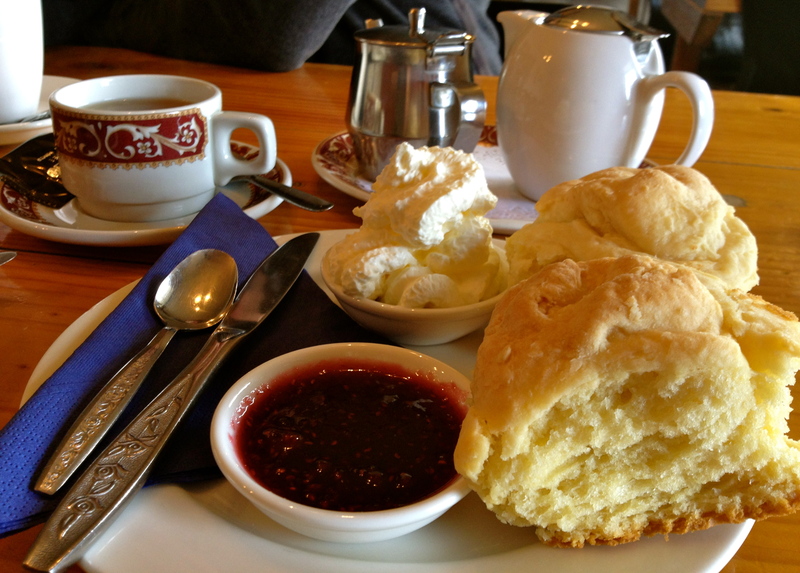 I’ve got to say that this has to be one of my favourite Devonshire Teas in Tasmania. Apart from the tea bags rather than loose-leaf tea, they’ve got it pretty much right. The scones are light and fluffy, just the right size and texture for a morning or afternoon tea, after all, they’re not supposed to be a meal, just a snack. The homemade apricot and raspberry jam is fruity and rich even though a tad runny, but if you’ve ever made jam you know it’s the real deal. What takes the prize is the clotted cream, the British owner swears it’s Tasmanian made double cream, it even says so on the container. But I can assure you it’s clotted cream and it’s a dream. Check out the maze while you’re there – if – you can tear yourself away from the scones! Tea: A variety of teabags served in a good-sized pot. 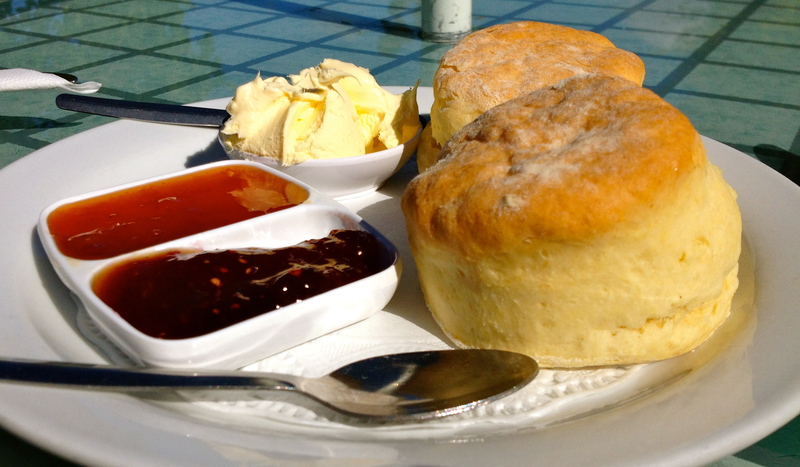 Overall: The perfect Devonshire Tea – not too heavy and not too light.